Stuntman and self-confessed adrenaline junkie Kriss Kyle has scaled some of the most dangerous places in the world on his trusty bike since the age of 10. But nothing quite prepared him for his latest assignment, when he jumped off a helicopter onto the helipad of the Burj Al Arab. 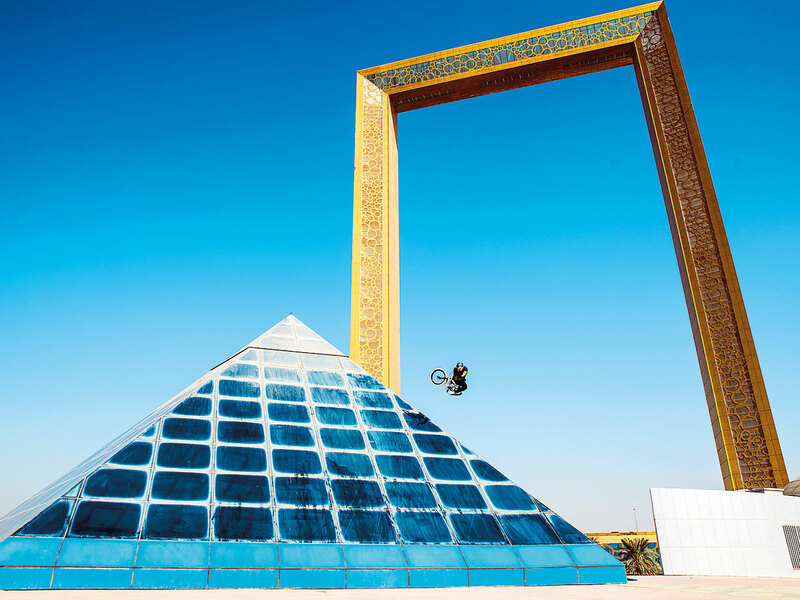 “A lot of people don’t know this but I’m actually really scared of heights so this is by far the scariest stunt I’ve ever done,” Kyle, a Red Bull BMX athlete, says of his jaw-dropping stunt. The 25-year-old award-winning Scotsman was in Dubai recently to shoot a short film for Red Bull, in collaboration with Dubai Tourism. Apart from performing dangerous stunts at some of the city’s landmarks, he also made time to surprise his long-time girlfriend Kayleigh Bowie with a proposal (she said yes!). Q: Welcome to Dubai, Kriss. Which were your favourite places to film in Dubai? A: Thanks. I’m so happy to be here working on this exciting project. That’s a tough question, as I’ve been to so many amazing places around the city. I reckon for me it would have to be the water parks we visited, Laguna water park and Wild Wadi. I’ve always dreamed of being able to ride a water park and for me this was a dream come true. Blasting through the flumes at high speeds and flipping at a height. It felt insane. 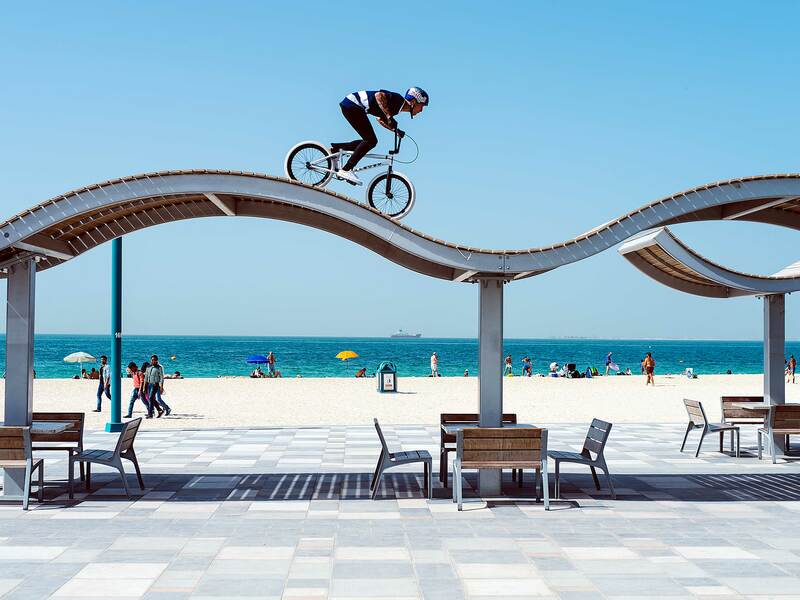 Q: Any place in Dubai you’d like to bike at but have not had the chance to? A: I’m blown away with the places I’ve been lucky enough to ride in but I’m always looking to ride in new places, spots and on different terrain. I think it would be awesome to do some tricks on top of the Dubai Frame if possible one day. 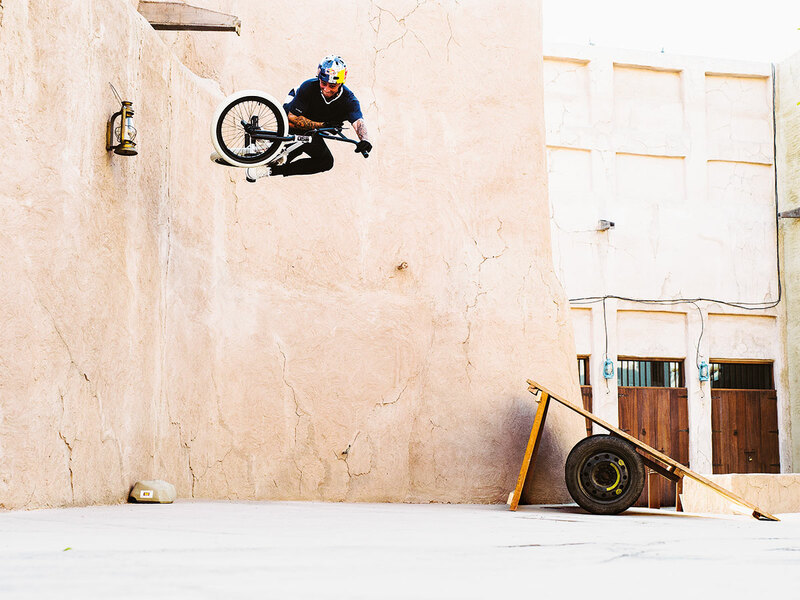 Q: What’s been the reaction from biking enthusiasts here in the UAE? A: Yeah, from what I have seen you have a strong biking community. Whether it be road cycling, BMX or mountain bikes, it seems you have it all here with great skate parks, amazing roads and awesome mountain bike trails. Q: Do you have a routine when you do your stunts or bike? Or does it change according to your environment? A: My routine is always the same. I usually see something that I think would be awesome and really fun to do. Then I picture it in my head, warm up on the bike and when I’m comfortable I try the trick/stunt. If I can’t picture it in my head I won’t do it. As I know it won’t work out and could possibly end badly. Q: Your sport has taken you to different parts of the world. Any favourite spots? A: Yes, I seriously can’t believe the places I’ve been to, the people I’ve met and the things I’ve seen all through riding my bike. For me one of the best places has to be Cape Town in South Africa as it was just such an amazing place with the mountains around it, great people and amazing spots to ride. I also love San Diego in California as it’s the main hot spot for BMX. They have perfect weather for riding all year round, a really motivated scene with amazing skate parks and street spots. To be honest, my list could go on and on with favourite places, all for different reasons. Q: How important is fitness to your sport? How do you keep fit? A: Fitness in my sport is very important. You need a strong upper body for throwing the bike around and good stamina. I do a lot of cardio, which consists of road cycling, running and also mountain biking as well as HIIT workouts as I feel this helps me stay at the top of my game, keeping me motivated to push the boundaries of BMX. Q: Any stunt you will never attempt again? A: Not that I can think of, I’m always looking for what’s next. Q: What’s the worst injury you’ve ever suffered? A: I’ve been relatively lucky so far only injuring the ligaments in my right ankle, breaking my big toe, tearing cartilage in my knee and a few broken ribs. Q: How did you start biking? When did you decide this is what you’d like to do for a living? A: I first started biking when I was 10 years old. My parents would take me out to the skate park to watch my older brother ride. It just looked like he and his mates were having so much fun. So for my 10th birthday, I begged my mum and dad for a small BMX. I couldn’t believe it when I got it. I had always dreamed of being a professional BMX rider but just didn’t think it would be possible. I just kept riding and progressing each day. Then I started going to contests. I first got noticed by Nike when I was 14 years old — they gave me products and looked after me, before turning pro when I was 17 years old. With that came travelling and more brand partnership opportunities. From there it was one thing after another and now I’m here jumping out of helicopters! It’s a dream come true and I still can’t believe it. Q: Do you have a crew that goes with you everywhere? A: Yes, it just depends on what project I’m working on. I usually have a good group of friends that are also my ramp builders called Vision Ramps, I trust them with my life. They can build anything and they always get it right. It’s great to be able to work with close friends on big projects, as it helps put my mind at ease. I also work with a few different camera guys, but mainly two, Matty Lambert and Dave Sowerby. I can trust these guys to nail the shot so sometimes I only need to do it once, depending on how scary it is. I’m very grateful for such an awesome crew. A: Very important, as I’m always looking to put out daily videos on Instagram to keep my followers up to date with tricks I’m doing and the places I’m visiting. It’s a great way to engage with fans. Q: What would you say to someone who wants to be the next Kriss Kyle? A: I would say go for it. You can do anything and be anyone you want if you put your mind to it. I believe if you want something badly enough and are passionate about it, then you will succeed no matter what. Q: What are the spots or locations you’ve always wanted to bike/perform a stunt at but haven’t? A: That’s a tough question. For me I’m just happy travelling the world, working on exciting projects and riding whatever gets in my way. Q: What’s a regular day for Kriss Kyle like? A: Usually, it consists of waking up at 6am doing a 5km run and then straight into porridge for breakfast. I then go pick my friends up in the van (having a Red Bull on the way to the skate park to get my energy levels up) and ride all morning and into the afternoon. Grab lunch, film a few Instagram clips and then drive home. I like to go out on my mountain bike in the evening for a chilled ride. Then I head home to make dinner for me and my girlfriend before she gets home from work. Then do it all over again the next day. 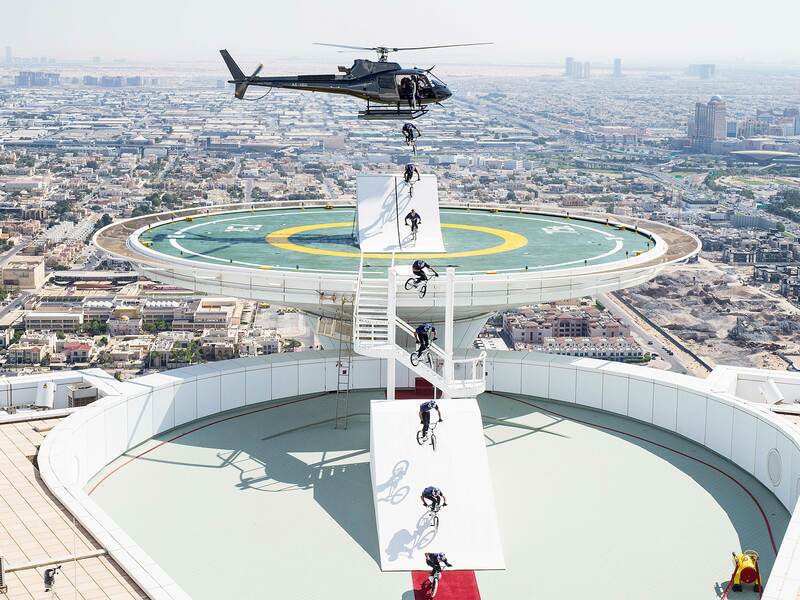 Kriss Kyle’s short film with Dubai Tourism called ‘Dropping in on Dubai’ is now available to view on redbull.tv.